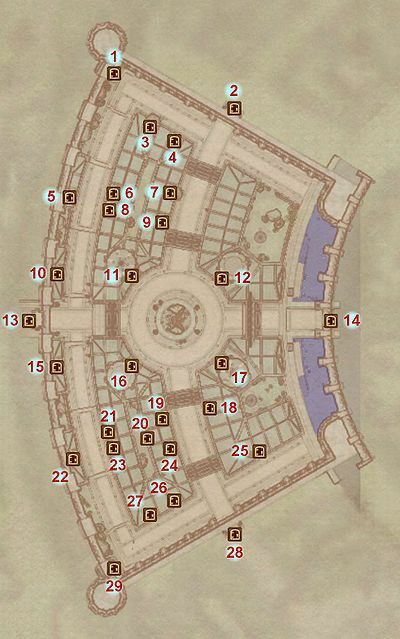 The Talos Plaza District is one of the six inner city districts in the Imperial City. This is the district where the wealthiest people of the Imperial City live. Note the relatively grand houses and the beautiful statue at Talos Plaza. ^a These NPCs are frequently stationed as guards within Umbacano Manor. Secrets of the Ayleids: Umbacano wants you to try to buy the Crown of Nenalata from a rival collector. The Collector: Help Umbacano, a collector of ancient artifacts, recover the "Ten Ancestors", a set of ancient Ayleid statues. Unfriendly Competition: A newly opened shop run by Thoronir is selling goods below cost, causing big problems for the other merchants. Next of Kin: Next to the Great Oak in Chorrol, your next assignment demands the lives of an entire bloodline. Esta página foi modificada pela última vez à(s) 20h48min de 26 de fevereiro de 2015.